Hello! I’ve got news of some upcoming events in Brooklyn, and then some coverage of the instrument-a-day project! 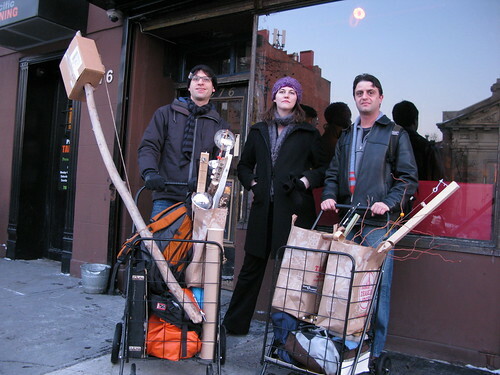 ON THURSDAY night, April 2, the Nutmeg Orchestrette– my little robot ensemble– will be performing as part of the NYC Electro-Acoustic Music Festival, along with a bunch of other excellent performers including R. Luke Dubois, Jane Rigler, and more! That’ll be at 11PM at Galapagos Art Space, 16 Main Street in Dumbo, Brooklyn; admission is $10, or maybe $5. If you haven’t been to Galapagos since they moved, it’s a great space! The Festival is also putting on an excellent series of free concerts all weekend at the Graduate Center in midtown Manhattan– check out the full schedule at their web site. ON SUNDAY afternoon, April 5th, Nick Yulman and I will be previewing our new electromechanical music installation in the lobby of the Coney Island Museum, right across from the intoxicating Freak Bar and the tantalizing Freak Show! I say “previewing” because we’re going to keep on adding to it as long as the museum lets us. (I’m working on a tiny pipe organ for June!) On Sunday you can see and hear a newborn sound sculpture, entangling the Nutmeg Orchestrette and more in its 24-volt tentacles. Sunday is also the museum’s annual Band Organ Rally, so you may also see some antique player pianos and barrel organs brought out by collectors. It’s a day of mechanical music, all for free! The Band Organ Rally will take place noon to 4:30 on Sunday the 5th, but the bar, sideshow, and museum are open every weekend and will probably soon be open all week for the summer. LAST MONTH I spent the whole month making a new handmade musical instrument every day, the second year in a row I’ve ruined February that way. It was a challenge, a learning experience, and an excuse to make lots of noise. I capped off the month with a performance with my friends in the experimental band The Glass Bees. Somehow, National Public Radio got interested in the project, and they recorded a nice little segment about it, which was broadcast on Weekend All Things Considered on March 7th. You can hear the whole show or just this segment at the links below, and the Glass Bees’ site has sound and video of the entire performance! Many thanks to Bethany Ryker, who found a spot for us in her weekly series of experimental, avant-garde, and sometimes just plain weird music, at Barbes in Brooklyn.